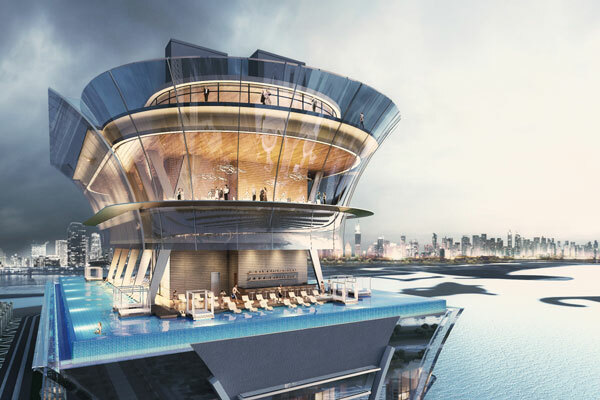 Master developer Nakheel has started the construction of a rooftop infinity swimming pool at its 52-storey, luxury hotel and residential complex, The Palm Tower, coming up in the heart of Palm Jumeirah in Dubai. The infinity pool, one of the highest in the world, is perched 210 m above ground and covering 775 sq m, it borders all four sides of the building, boasting unrivalled, panoramic views across Palm Jumeirah, the Arabian Gulf and the Dubai skyline, said a statement from Nakheel. The pool – which will hold 930,000 litres of water – is on the 50th floor of The Palm Tower, it stated. Above the pool will be a podium housing a 51st level speciality restaurant and a 52nd storey public viewing deck, 240 metres high. Nakheel said the construction of the rooftop dining viewing deck complex will begin soon. Located at the heart of the world-famous, award winning Palm Jumeirah, The Palm Tower comprises a 289-room St. Regis hotel, 432 luxury residences and an array of dining and leisure facilities. The hotel occupies the first 18 floors, with fully-furnished studios and one, two and three bedroom apartments on the upper floors. Currently, around 850 construction workers are on site at The Palm Tower, rising to more than 1,500 when internal fit out gets in full swing in the next few weeks, said the master developer. Fit out of the St. Regis – due to open later this year – has already begun, it added. The Palm Tower is directly connected to the under-construction Nakheel Mall – the access point for the public viewing deck – and its 350 shops, restaurants and attractions. The retail destination, which has its own Palm Monorail station, is due for completion later this year, said the statement from Nakheel.